160 pages. Features weekly/monthly planning pages, journal pages, smooth writing paper, sturdy cover board with soft-touch laminate, matching bookmark ribbon, elastic closure, expandable pocket with stickers. 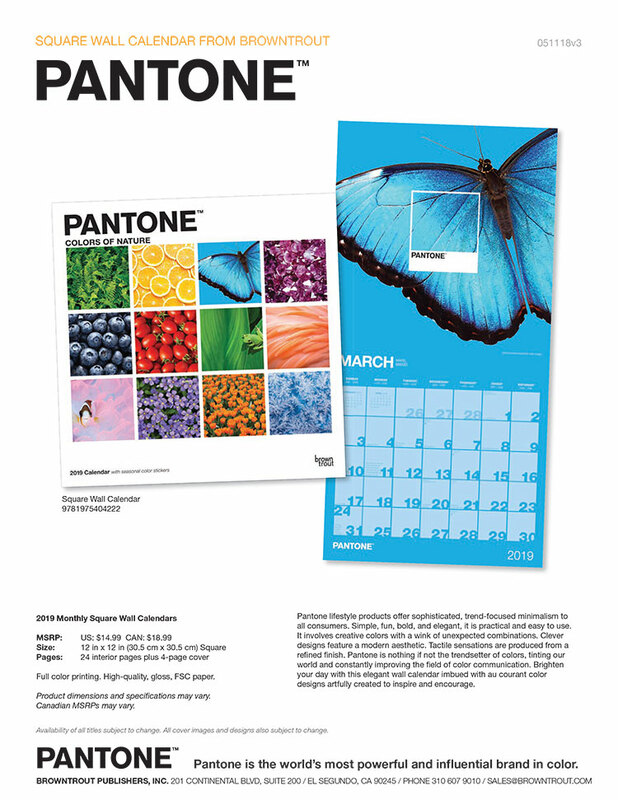 Pantone lifestyle products offer sophisticated, trend-focused minimalism to all consumers. Simple, fun, bold, and elegant, it is practical and easy to use. It involves creative colors with a wink of unexpected combinations. Clever designs feature a modern aesthetic. Tactile sensations are produced from a refined finish. Pantone is nothing if not the trendsetter of colors, tinting our world and constantly improving the field of color communication. Brighten your day with this elegant wall calendar imbued with au courant color designs artfully created to inspire and encourage. 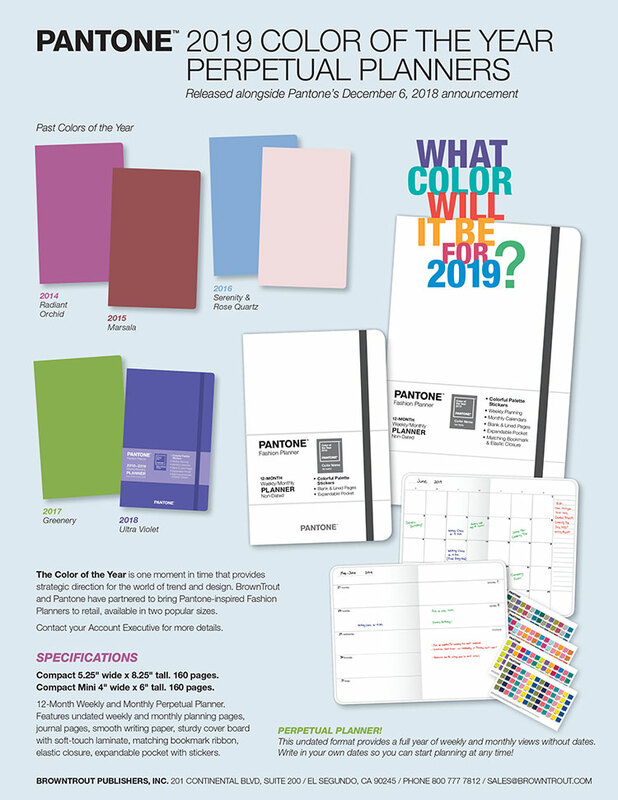 Pantone™ 2019 Color of the Year Perpetual Planners by BrownTrout™ - Coming in December! The Color of the Year is one moment in time that provides strategic direction for the world of trend and design. BrownTrout and Pantone have partnered to bring Pantone-inspired Fashion Planners to retail, available in two popular sizes. Features non-dated weekly/monthly planning pages, journal pages, smooth writing paper, sturdy cover board with soft-touch laminate, matching bookmark ribbon, elastic closure, expandable pocket with stickers. Pantone is the world’s most powerful and influential brand in color. 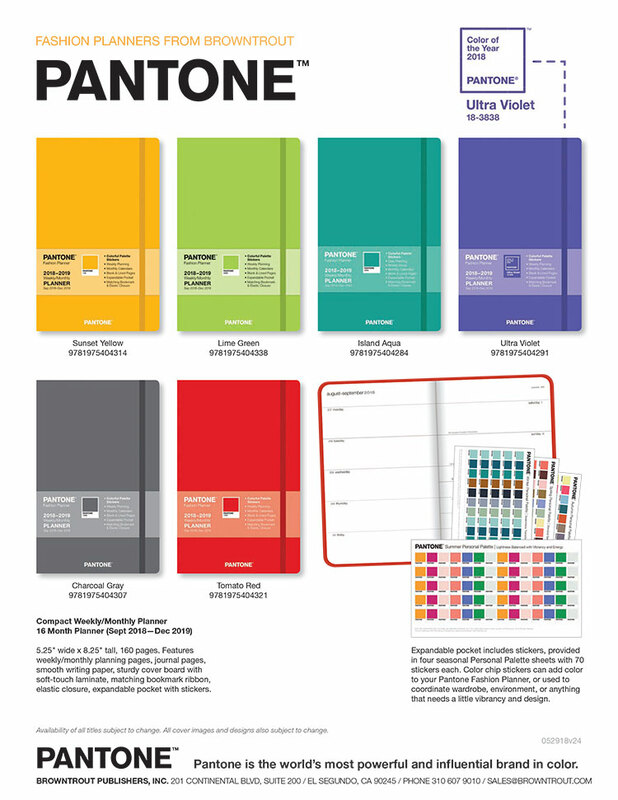 Pantone lifestyle products offer sophisticated, trend-focused minimalism to all consumers. Simple, fun, bold, and elegant, it is practical and easy to use. It involves creative colors with a wink of unexpected combinations. Clever designs feature a modern aesthetic. Tactile sensations are produced from a refined finish. Pantone is nothing if not the trendsetter of colors, tinting our world and constantly improving the field of color communication.